Lawrence, a city of just over 80,000, was founded by Free-Staters from the Massachusetts Emigrant Aid Company just after Kansas became a territory in 1854. The phoenix city was partially destroyed in 1856 by Pro-slavery Sheriff Samuel Jones, then devastated by Quantrill's Raid in 1863. In her novel Bleeding Kansas, Sara Paretsky layers the territorial period, and the 1960s, into a textured look at rural Lawrence during the 1980s. The University of Kansas was founded in Lawrence in 1865. Helen Rhoda Hoopes taught there, and the school is alma mater to many Kansas writers including Steven Hind, Laura Moriarty, Robert Day, Evan S. Connell, Jr., Thomas Fox Averill, May Williams Ward, William Inge, Stephen Bunch, Roger Martin, Sarah Smarsh, Mary Stone, Mary O'Connell, and Denise Low. Edgar Wolfe taught creative writing at the university for many years, and many Kansas writers, like Averill and Day, owe him a great debt. Moriarty teaches in the English Department at KU, as does Kenneth Irby, Joseph Harrington, and Darren Canady (who was hired after the retirement of playwright Paul Lim). John Edgar Tidwell, who writes about and brings forward the work of Franklin Marshall Davis, is also a member of the KU English Department. Elizabeth Schultz, now retired, has become a prolific poet. David Ohle received his Master degree from KU as well as taught fiction and screenwriting there, retiring in 2015. Herpetologist Joseph Collins had many books published by the University Press of Kansas. Fiction writer Andrew Malan Milward grew up in Lawrence. Novelist Bryn Greenwood works at the univerisity of Kansas. Susan Kraus spent eight years in Topeka (1978-1986), but has been in Lawrence working as a therapist, mediator and writer ever since. 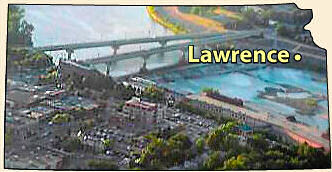 Novelist William S. Burroughs spent the last years of his life in what people often call "The River City." Denise Low, Kansas Poet Laureate for 2007-08, makes her home in Lawrence and spent her teaching career at Haskell Indian Nations University. She has written a book indexing all the Lawrence sites associated with Langston Hughes and the years he spent there. Caryn Mirriam-Goldberg became Kansas Poet Laureate after Low. "A Personal Reading of the Literature of Douglas Country, Lawrence and the University of Kansas," by Thomas Fox Averill, was written in 1985, and later published in Cottonwood 35: A Retrospective. Joe Harrington wrote about Lawrence Literary Culture in his Editor's Note in the Lawrence Poets edition of Locustpoint (2007).